Dry Weather – It should be no surprise to me by now that things get pretty dry on the farm in July and August. This year, our customary summer drought started earlier than usual, in the last week of June. That means that we’ve now had about 35 days without rain, and it looks like it’s going to continue to be dry through the next 10 days (with a small chance of thunderstorms this weekend). As I mentioned in an earlier newsletter, we have a pretty limited capacity for irrigation, relying only on a not-very-productive well, which means that a lot of our water-loving crops are feeling a little parched right now. We are wrapping up transplanting of our fall crops, so a lot of our daily water budget is being used to water these seedlings as they go in the ground. We are also laying drip tape down on all of our direct-sown crops, because the top couple inches of soil are so dry that seeds won’t germinate without supplemental water. That leaves us with just enough extra water each day to irrigate a small section of our long-season crops like kale and chard to help them get through the long dry summer. What this dry spell means for the CSA boxes is a bit of a break from the leafy greens. No lettuce this week, for a change, although salad greens are still going strong. Salads this week can be built on cucumbers, fennel, and thin-sliced cabbage. Mid-summer crop report – Although the persistent dry weather can be stressful for leafy greens and for farmers, there are lots of crops that are absolutely thriving in this warm summer. By now you have probably noted the abundance of zucchini, and the cucumbers are now also producing heavily. We strategically planted these crops in low-lying fields, so they are closer to our natural water table just a few feet below the surface. Also planted in this zone is winter squash, which are displaying a somewhat intimidating number of fruit for late July… It looks like it will be an early and bountiful squash season. 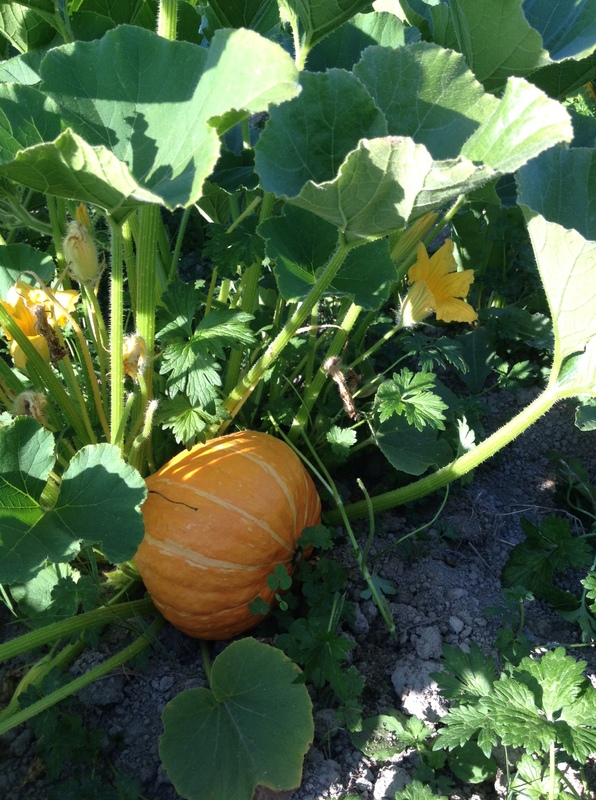 Red Kuri squash, nearly ripe on July 29. This is also the time of year we start the annual tomato watch. We planted 350 more plants than normal (for a total of 770 plants) to make sure we would have plenty of tomatoes for the 50 extra CSA members we added this year. The fruit set on our tomato plants is impressive, and with plenty of heat and sun in the forecast, our August tomato harvest is looking promising. The first of three successions of green beans are flowering and should be in your box soon, along with basil. Welcome to the heart of summer! As we move into the season of root-like things (potatoes, carrots, beets, onions) and fruits (zucchini, cucumber, tomato), the weight of the CSA boxes increases, even as the volume of light and puffy leaves temporarily diminishes. This reflects the longer growing time that plants require to flower and produce fruiting bodies and to grow dense, nutrient-filled roots, as compared to the relatively short time needed to just make leaves. Saute onion and garlic, with salt, basil and oregano, in olive oil until onion is translucent. Add zucchini and sauté until soft. Spread onto toast and sprinkle with fresh Parmesan. This one should be broiled, not grilled. Parmesan loves to broil. New Potatoes – Next week we’ll be digging in to our blue potatoes, which have more of a baking potato texture, but this week we are again treating you to delectable new potatoes. “Desiree” is the variety name. If you still have some of last week’s dill it would be lovely with these potatoes. I focus a lot of my cooking and recipe advices on dinner, which is the main meal of the day in our house during the summer. Breakfast tends to be toast and fruit so we can get started quickly on the morning work. However, sometimes we manage to make a big hearty breakfast dish for a mid-morning snack, and recently it’s been sautéed veggies, either with or without the addition of wonderful farm-raised eggs. My main ingredients are potatoes, onions, and zucchini, cut into similar size pieces for even cooking. I like crisped surfaces on my potatoes, so if I have the burner space, I’ll sometimes cook the potatoes separately so they have lots of room to brown. Cheese, salsa, and/or avocado make good toppings. Cabbage – You are receiving either crinkly savoy or smooth-skinned green cabbage this week. Both are quite tender and sweet, ideal for making slaw. This week’s scallions and carrots would be great additions to a cabbage slaw.